A month after the Battle of Antietam (October 10-11, 1862) Confederate Major General James Ewell Brown Stuart was ordered through Maryland to Pennsylvania for the purpose of destroying bridges, gathering supplies and taking hostages for later exchange for Confederates and southern sympathizers being held by the Union. 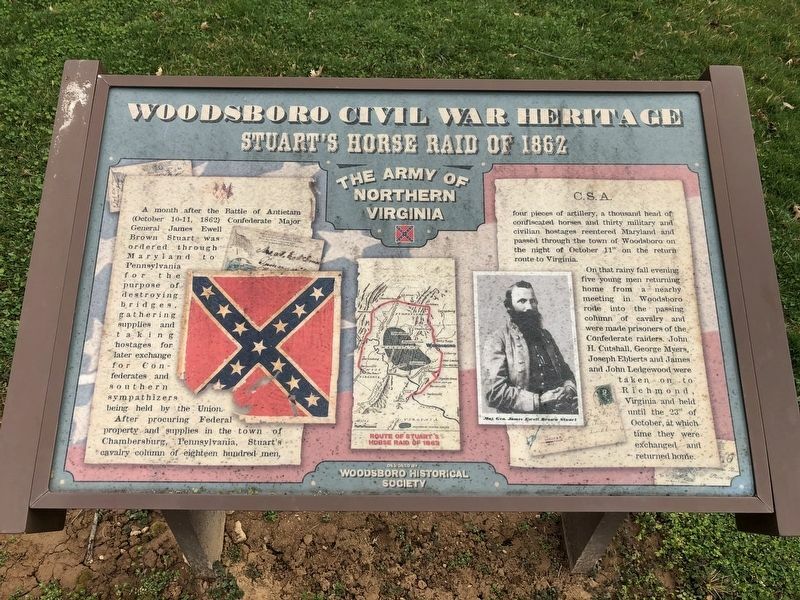 After procuring Federal property and supplies in the town of Chambersburg, Pennsylvania, Stuart's cavalry column of eighteen hundred men, four pieces of artillery, a thousand head of confiscated horses and thirty military and civilian hostages reentered Maryland and passed through the town of Woodsboro on the night of October 11th on the return of route to Virginia. 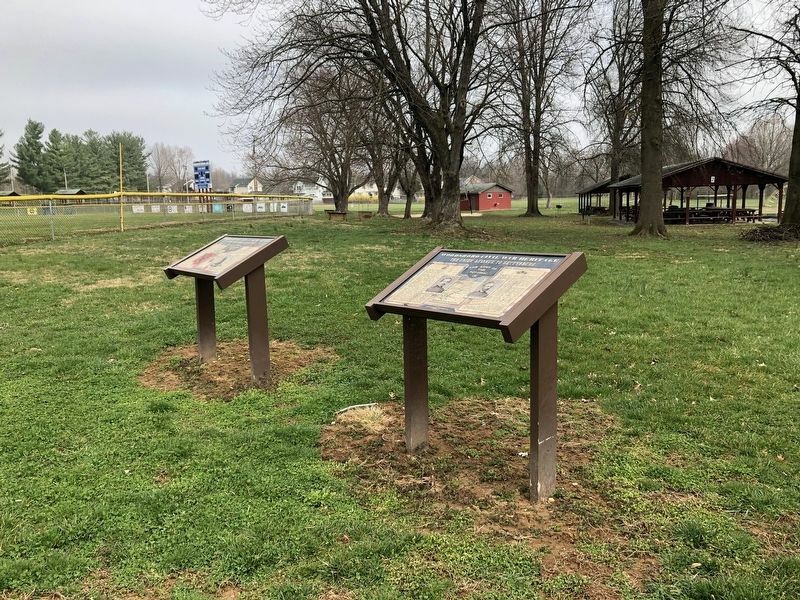 On that rainy fall evening five young men returning home from a nearby meeting in Woodsboro rode into the passing column of cavalry and were made prisoners of the Confederate raiders. John H. Custshall, George Myrers, Joseph Ebberts and James and John Ledgewood were taken on to Richmond, Virginia and held until the 23rd of October at which time they were exchanged and returned home. Location. 39° 31.943′ N, 77° 18.549′ W. Marker is in Woodsboro, Maryland, in Frederick County. Marker can be reached from Council Drive north of Woodsboro Road (Maryland Route 550), on the left when traveling north. Touch for map. Marker is at or near this postal address: 1 Council Drive, Woodsboro MD 21798, United States of America. Touch for directions. Other nearby markers. At least 8 other markers are within 5 miles of this marker, measured as the crow flies. The Union Advance to Gettysburg (here, next to this marker); George Washington (approx. 2.3 miles away); George Poe (approx. 3 miles away); Israel's Creek (approx. 3 miles away); Grinder/Slaker Shed (approx. 5 miles away); Boiler House (approx. 5 miles away); Chemistry in the Kiln (approx. 5 miles away); Atop the Kilns (approx. 5 miles away). More. Search the internet for Stuart's Horse Raid of 1862. Credits. This page was last revised on April 6, 2019. This page originally submitted on April 6, 2019, by Devry Becker Jones of Washington, District of Columbia. This page has been viewed 48 times since then. Photos: 1, 2. submitted on April 6, 2019, by Devry Becker Jones of Washington, District of Columbia.